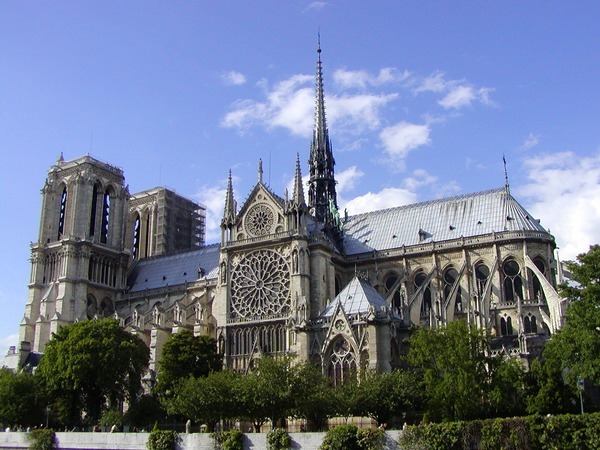 Going Places Educational Travel Blog - How Much Do You Know About Notre-Dame Cathedral? How Much Do You Know About Notre-Dame Cathedral? It's true, Notre-Dame was not originally designed with the flying buttresses it is historically known for! However, the cathedral was one of the very first buildings ever to use this unique support structure. The purpose of the flying buttress is to avoid stress fractures along a high building's walls from lateral forces that tend to push a wall outward. This generally happens in a stone structure that has vaulted ceilings. A flying buttress does not actually come in contact with the wall it supports, and the upper flyer on a building like Notre-Dame acts as a resistor against wind load. By using flying instead of traditional buttresses, architects were able to install windows to let in more light. The flying buttress became the staple of Gothic architecture and came to be standard in church design. Some time in the 20th century, a Canadian engineer, William P. Anderson, also used flying buttresses in the building of lighthouses. Another staple of Gothic architectural style, and one of the best features of Notre-Dame, is its rose window. Finished in 1255, it is the Gothic stained-glass window that most others are modeled after. Sometimes known as a Catherine window, named for St Catherine of Alexandria, who was to be executed on a spiked wheel, the rose window may date as far back as the 6th or 8th century in terms of church architecture. But, they are a standard characteristic of Gothic Cathedrals, particularly those in France such as Strasbourg, Chartres, Notre-Dame and Reims. Other names are "wheel window" because the window appears to have spokes emanating from a central opening. But the "rose window" terminology began to be used in the 17th century, based similarly on the fact that the design bore a striking resemblance to a blooming rose with many petals. Quasimodo! Ring those bells! In 2013, the cathedral's 10 famous bells were replaced. Did you know each of the bells has a name? The other bells are named: Marie, Gabriel, Anne Genevieve, Denis, Marcel, Etienne, Benoit-Joseph, Maurice and Jean-Marie. A little of both. You mean someone actually owns Notre-Dame Cathedral? Well, not exactly. The building is owned by the French State, but the Catholic Church has the right to use the building for religious function...forever. The Catholic archdiocese pays a staff of many to maintain and service the church, and receives no funding from the French State. About those gargoyles -- they aren't just another pretty face. No, sir! Indeed, they serve a necessary and unique purpose. They're actually sort of like a gutter. Gargoyles were designed to protect the cathedral's outer walls from damage due to water runoff from rain. Each gargoyle has a spout imbedded into the design to divert water away from the building. Some buildings (including Notre-Dame itself) also have ornamental "gargoyles" that do not have a water spout and don't serve a purpose -- these are, in fact, not gargoyles at all. They are called chimera, bosses, or grotesque. 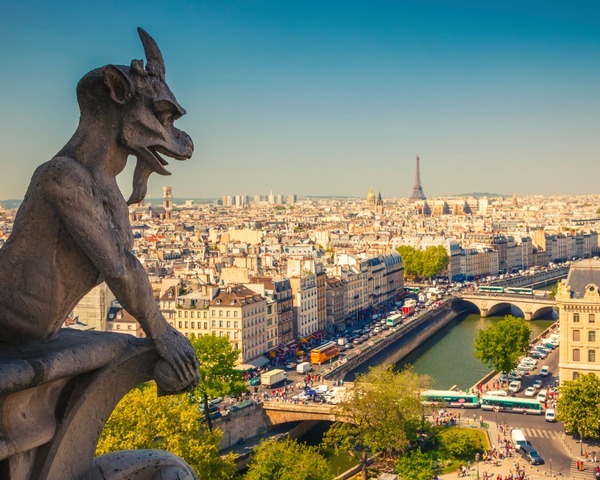 The word "gargoyle" comes from the French root word gargouille which means gullet or throat. The more familiar word for us English speakers is gargle, or gurgle from the same root word. The Italians have a gargolla o gargugliia which literally translates to "protruding gutter".